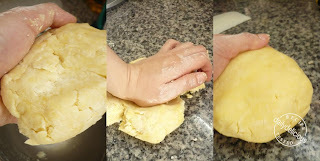 There're times that I just running around everywhere but my kitchen^^", I know that I complain about it many times already but what can I do, when I still believe that I need more (and a lot more) times to bake. Lately I end up baking 3-4 items, in one day, when I have free time to make me feel better. Usually, for me baking is like a journey to a new place, I always find something new, something that I want to try each time that I bake. But when I seek comforting from my baking I don't want any kinds of adventure. All I need is something that I can trust. This time I choose brownie, one of (almost) everybody's favorite. 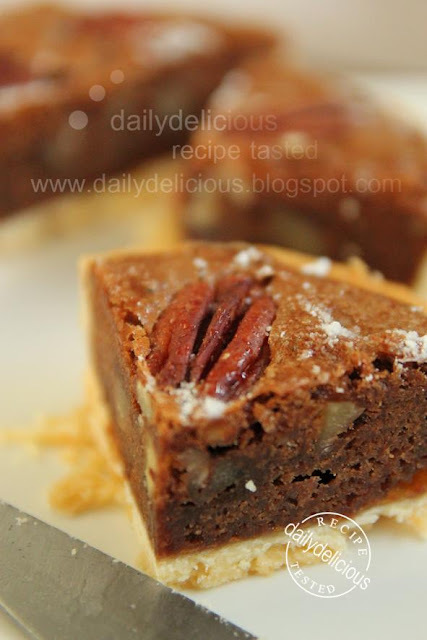 This brownie comes in tart form and loaded with pecan nuts (the taste of pecan nut is getting along very well with chocolate). 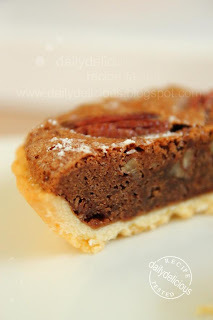 The method for making the filling is so easy and for the pastry you can make your life easier by using store-bought prebaked pastry. 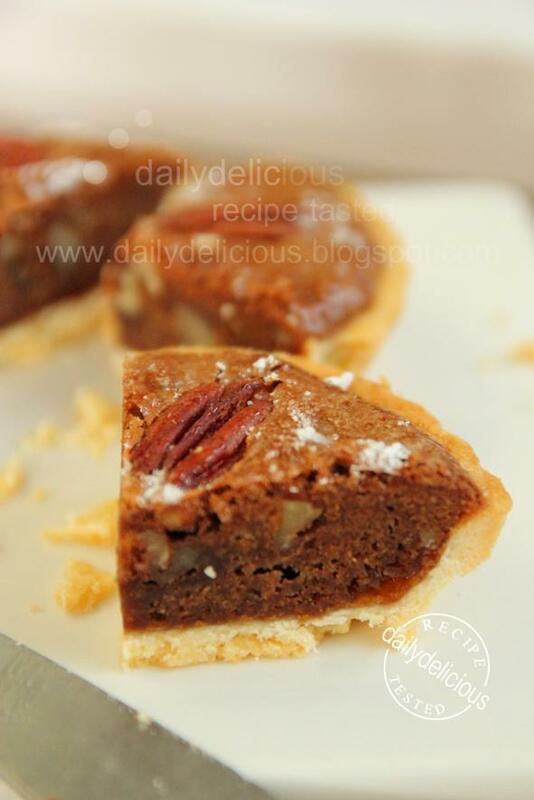 The original recipe comes from Olive magazine but I could't resist to turn it into small size, and I know that not all of you want to buy the prebaked pastry so I add the recipe for shortcrust pastry too. 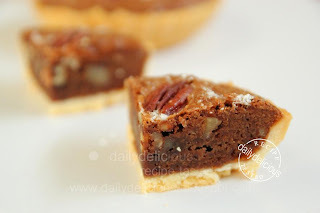 While baking, I inhale the sweet aroma of the chocolate, nut and butter, they makes me feel peaceful ^^, and beside from feeling better, I have a great snack for my afternoon too. Put flour, sugar and salt into a mixing bowl, whisk to combine. 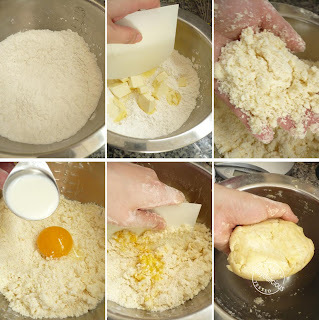 Cut the butter into the flour mixture until resemble fine breadcrumbs. Put the yolk and milk into the bowl and stir until all the flour is moisten. 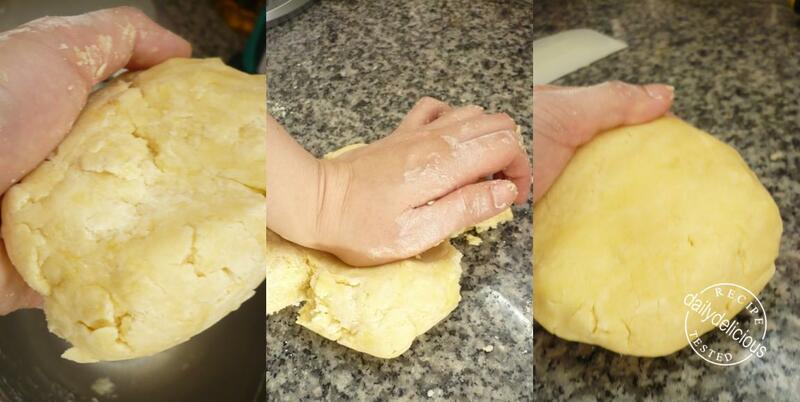 Knead lightly until smooth (by folding it 4-6 times). Cover with plastic warp and refrigerate for 30 minutes. 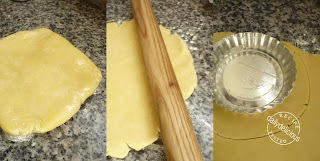 Roll the pastry, and cut into desired size. Place the pastry over the tart pans and trim it. Cover and refrigerate for 30 minutes, meanwhile preheat the oven to 200°C. Bake blind for 10 minutes, then take the baking beans out and bake for 5 minutes more. And reduce the temperature to 180°C. Melt the and butter chocolate by putting them in a bowl and place the bowl over the hot water. 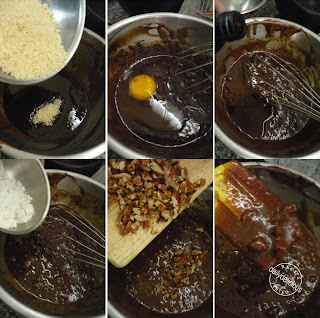 When all the chocolate completely melt, stir the sugar, egg, vanilla extract, flour and chopped nut into the melted chocolate. 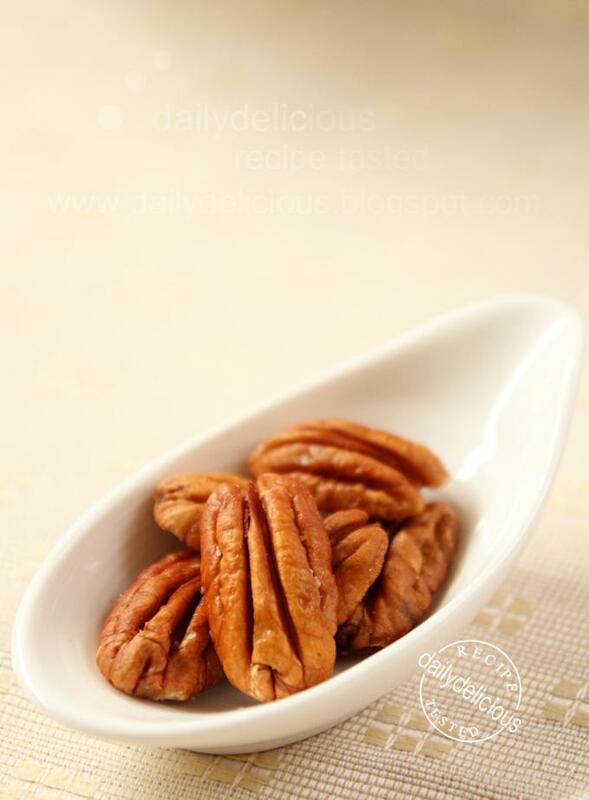 Pour the filling into the baked pastries and decorate with pecan halves. That is a delicious and innovative preparation.. simply decadent!! 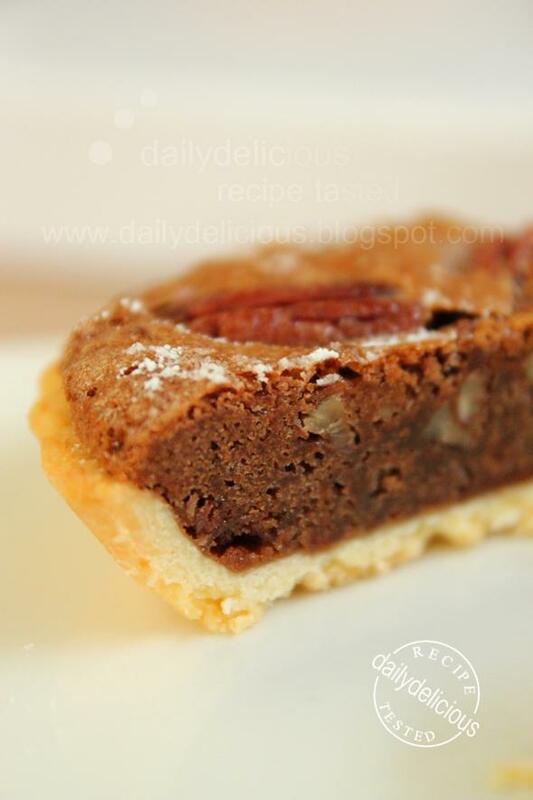 Wow, am speechless and cant take my eyes from those delectable and addictive tart..
Wow, it’s so delicious. Can I have a bite? I bet it’s tasty. Lovely pics indeed.